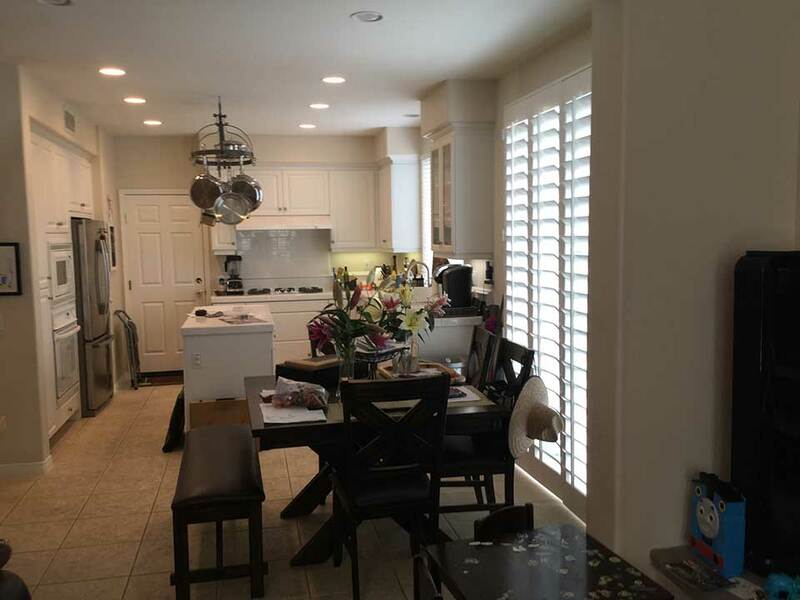 Before the complete remodel of this Ladera Ranch kitchen and adjoining bathroom, the homeowners had a common issue. Their kitchen felt cluttered, outdated, and it lacked any design elements that made it feel customized or unique. 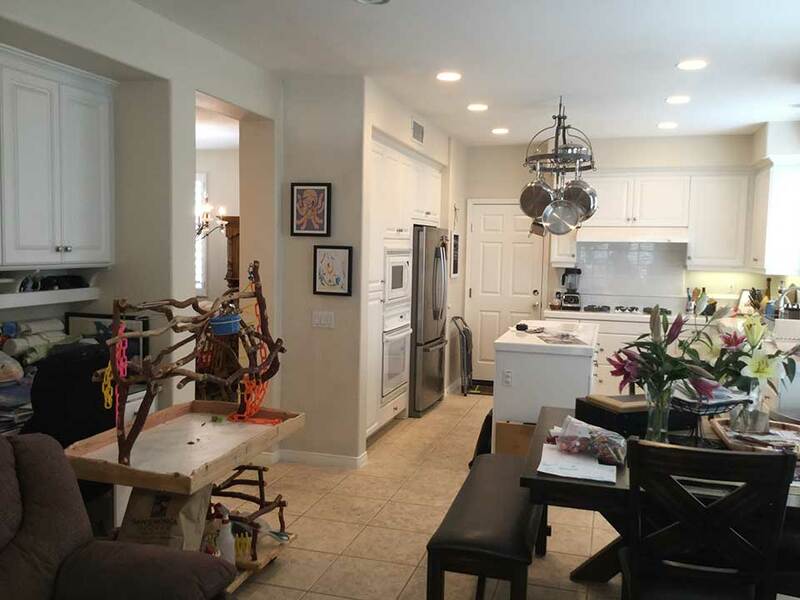 The floorplan worked for the homeowners, but the reason everything felt cluttered was because of the lack of functional, practical storage. 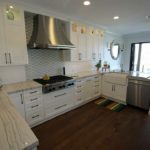 The kitchen had a monochromatic color palate that felt bland and uninspired, the cabinets were standard builder-grade, and the tiled flooring also felt very dated. 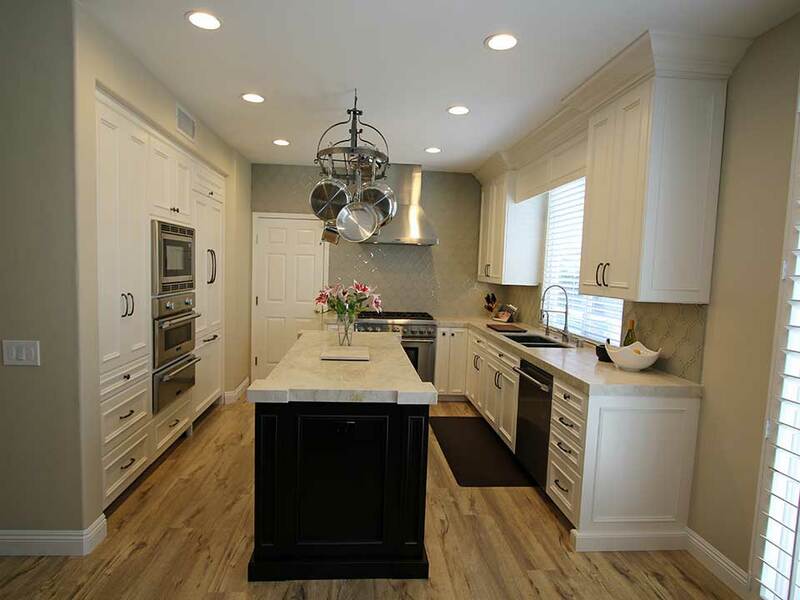 The primary focus of this Ladera Ranch kitchen and bathroom remodel was to give it a stylish redesign focusing on high-end materials and custom cabinetry and storage. 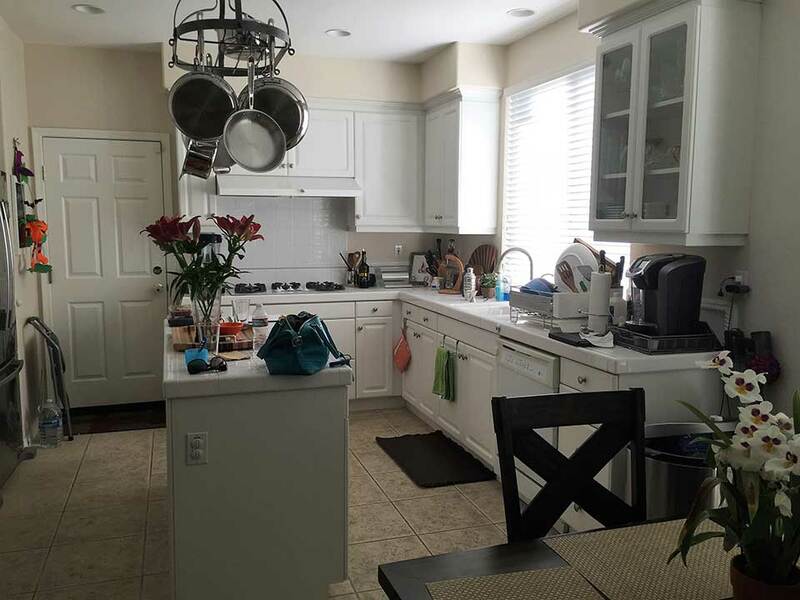 Along with the aesthetic appeal of this Orange County kitchen remodel, functionality was a key concern. 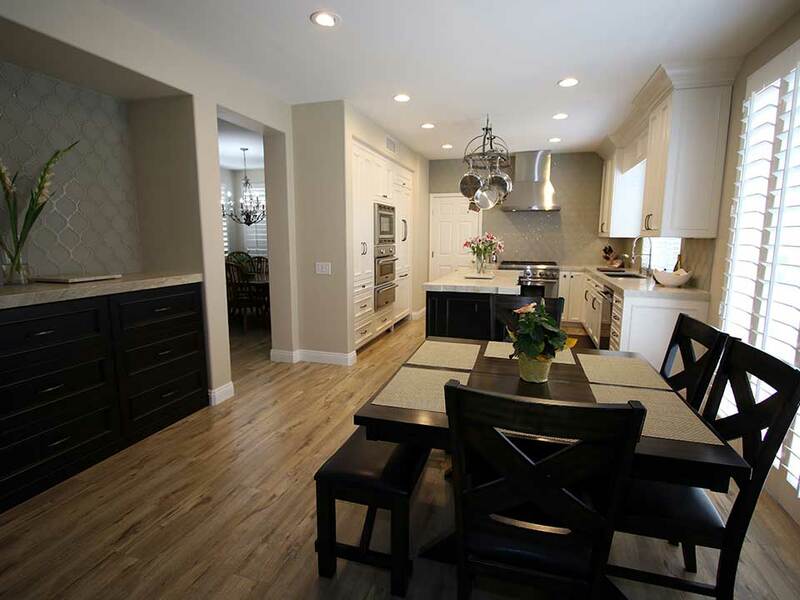 While the main floorplan of this Ladera Ranch kitchen stayed relatively similar, the design of the custom cabinets was critical to the project. The cabinets in the primary portion of the kitchen perimeter were designed to feel fresh, light and airy, while also maximizing available storage space. 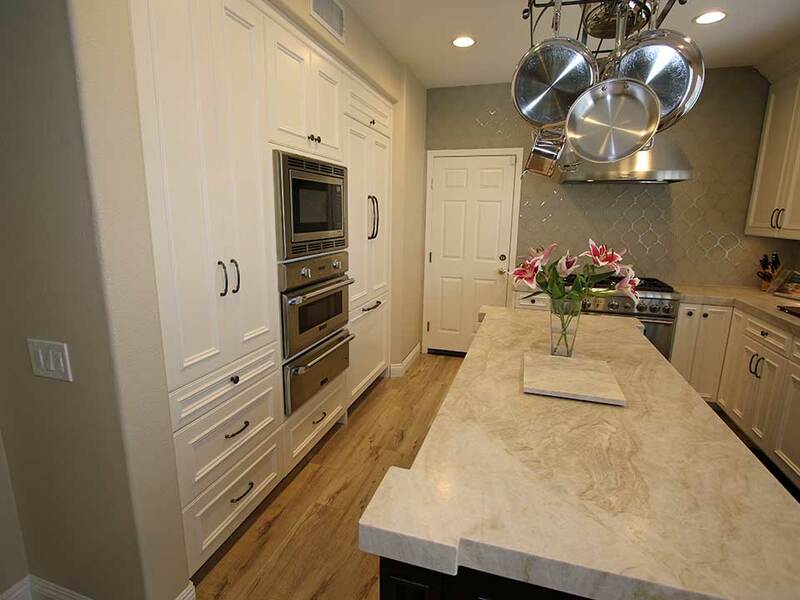 These Orange County homeowners selected perimeter cabinets with a Euro construction style, and a Winter White finish. Details included in the design of the custom cabinetry included single wainscoting with valances and some beading work. The door style is Victorian. 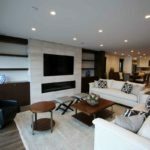 To add distinctive contrast, which was entirely missing from the previous design, the APlus team created a custom island topped by white stone, with a dark finish. 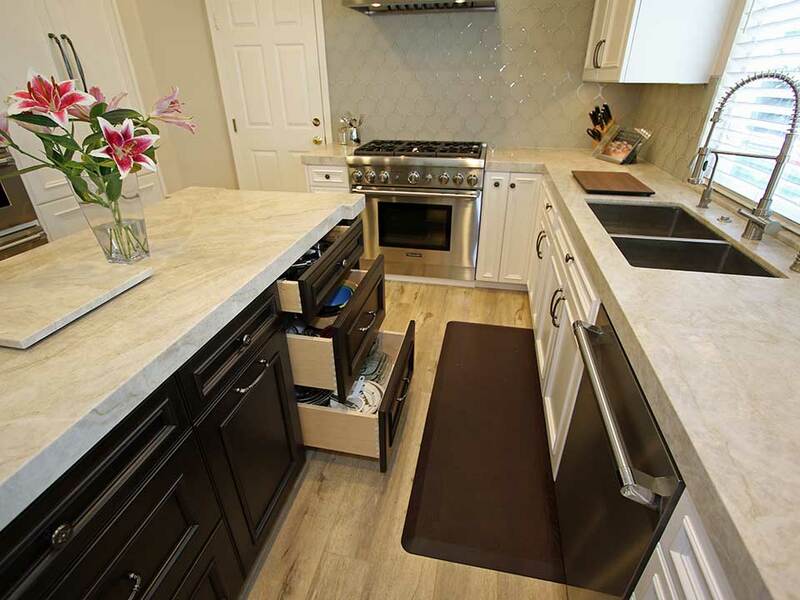 The finish color, Dark Manganese, is a dramatic contrast to the light perimeter cabinets, and it adds visual interest that was missing in the original design of this Orange County kitchen. 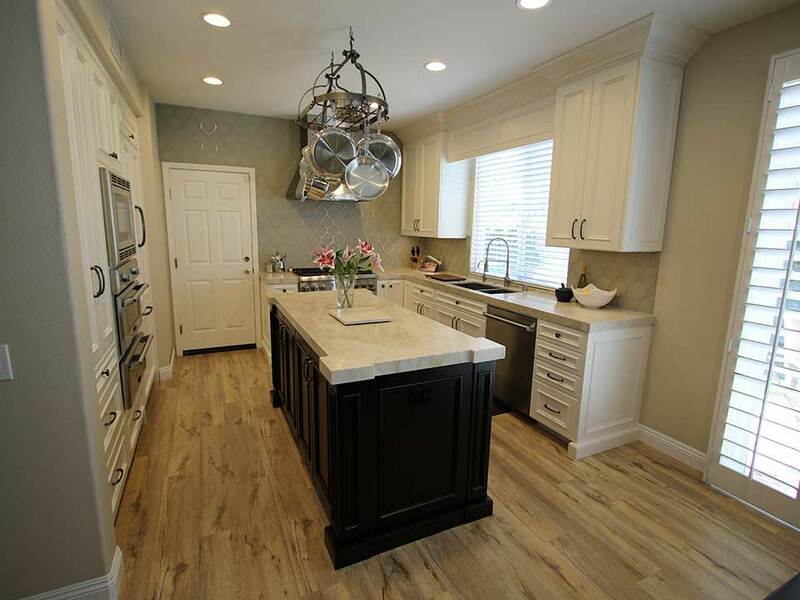 The wood plank flooring is a light wood with hand-scraped detailing, and it runs throughout the kitchen and dining area. Where there was once a workstation opposite the eat-in dining area in the kitchen, there is now a custom cabinet/bar area. These cabinets are also a Dark Manganese finish, with a stone countertop. 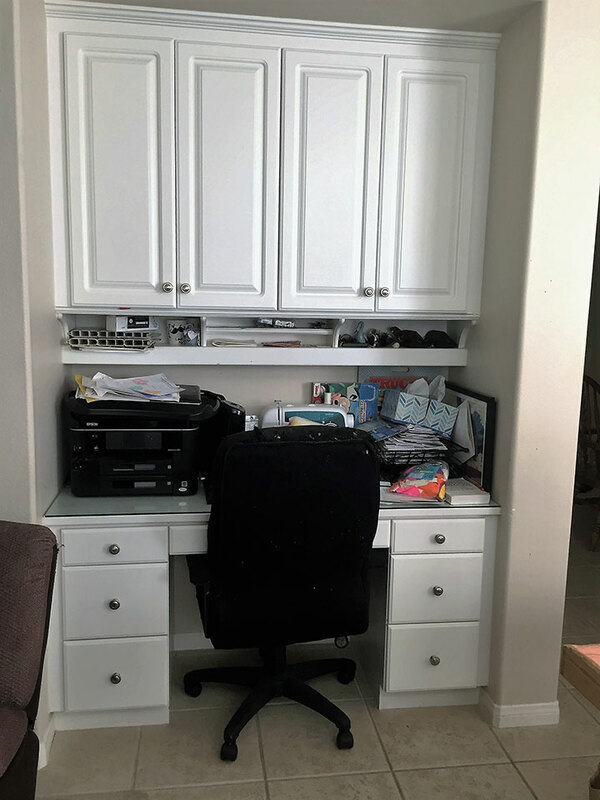 This area adds additional storage space, which the homeowners were looking for. The drawers in this custom kitchen design include upgrades such as soft-close features, and they’re deeper than the previously available drawers, for increased functionality. 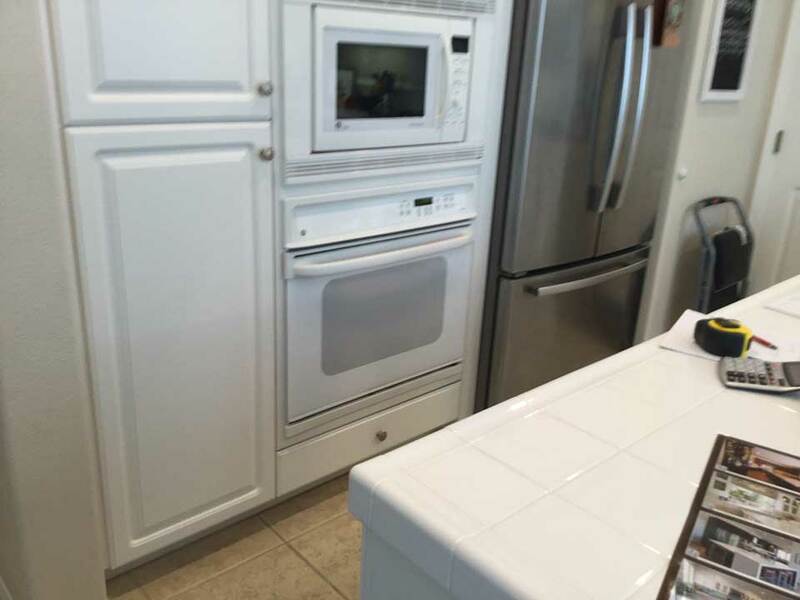 The wall where the oven and microwave are located include built-in pantry spaces, with pull-out drawers and shelves, dividers to organize cooking tools, and other convenient upgrades. 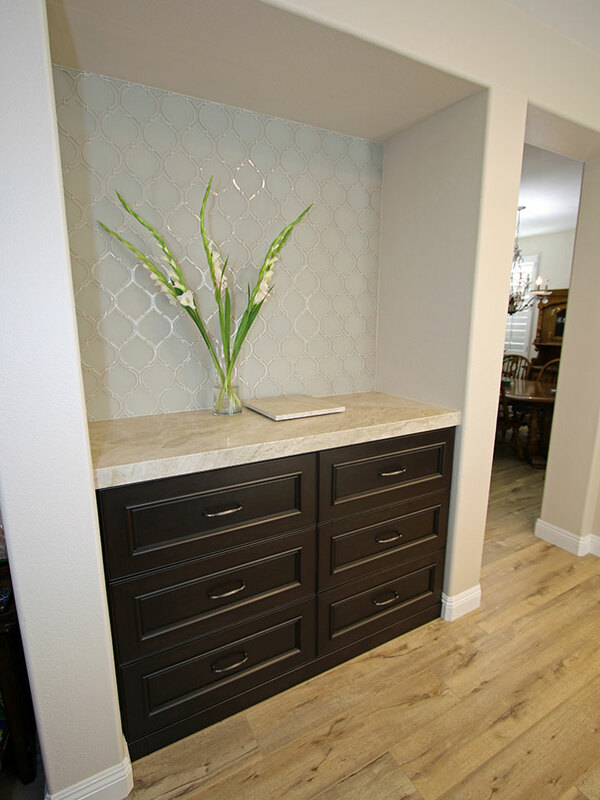 Behind the Thermador range, there is frosted arabesque tile, which is also added as an accent above the bar space. In an unused corner of the kitchen, storage was further maximized through the addition of another Dark Manganese cabinet and bar area, also with upper cabinets in Whisper White. Above the range is a Thermador chimney hood with a blower, and this Orange County kitchen remodel now includes a 30-inch Thermador warming drawer with soft close hinges and three temperature settings. The 36-inch Thermador stainless steel flush custom French door refrigerator includes features like LED sidewall and theater lighting. The kitchen sink is a Blanco Precision under mount option from the Steelart line, and the range is a 36-inch Pro Harmony Thermador model with duel-fuel capabilities. Also part of this Ladera Ranch remodel was an adjoining powder room. 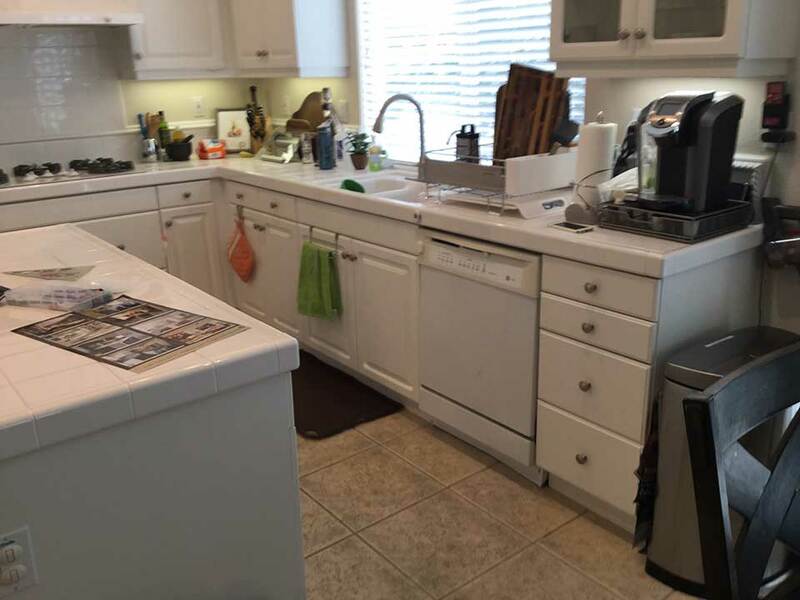 In the previous design, the bathroom had the same outdated, large square tile flooring of the kitchen, along with a tiled countertop and an awkward countertop design. The APlus team remodeled the bathroom to include the same cabinet style found in the main area of the kitchen, as well as the light hardwood flooring. The bathroom sink from Waterworks is an under mount, Vitreous China single-glazed design with a high-gloss finish, contributing to a feeling of practical elegance. The bathroom cabinets are finished in Winter White.